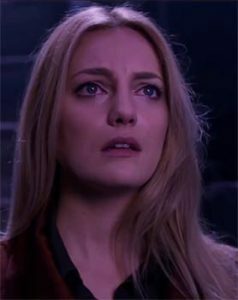 Interview: Leila George Talks ‘Mortal Engines’ – Spotlight Report "The Best Entertainment Website in Oz"
Australian born actress Leila George is set to become one of the hottest names in Hollywood as her latest film ‘Mortal Engines’ is about to hit cinemas this December. 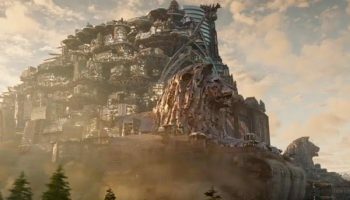 Based on the popular series of books, ‘Mortal Engines’ is directer by Christian Rivers and produced by Peter Jackson and is by far one of the most anticipated blockbusters of the year. 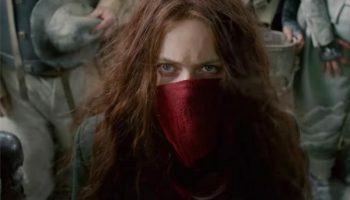 Thanks to Universal Pictures Australia, we had the chance to sit down for a nice chat with Mrs. George in order to find out more about playing the role of Katherine in the the Mortal Engines world, her upcoming film ‘The Kid’ which is directed by her father Vincent D’Onofrio and much more. SR. Congratulations on the film. Definitely this will be a huge step in your career. We wonder how was working with director Christian Rivers on set? LG. He was great. Christian gave us a lot of freedom to play and do what we believe was better for our characters. He was never micro-directing us, he had a clear vision of what the scenes needed to achieve, and was always open to hear our ideas. 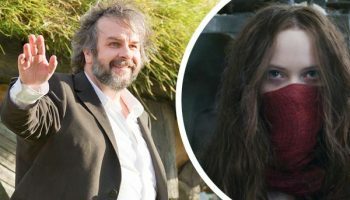 SR. You also had director Peter Jackson producing the film. How much did you see him on set and how much input she had on your work? LG. Peter was almost everyday on set. As a producer he was very supportive and giving some opinions. It was just amazing and a big honour to being on set with him. SR. We assume is was mind blowing walking into this huge sets created for the film. How was your first day on set? LG. I actually arrived a couple of weeks early, so I was able to see the amazing job everyone was doing around before shooting my parts. The people there in New Zealand was lovely and the entire cast and crew was fantastic. My first day filming I was taken to do all my makeup and costume fitting and then they took me on a tour of the sets and the sound-stage and that was the first time I really hit me where I was and what I was about to do, so after seen all the talent around me I was super committed to bring my full “A Game” into the film (laughs). SR. Obviously there was a lot of CGI involved in the film. How challenging was to perform in virtual scenarios? LG. There was a lot of it, but as I said they actually built most of the stages we performed in. For example the museum where my character is first introduced was fully real, they did it all and was impressive to see the details of every prop there. The production design built so much, that actually was easy for us to act because we could see and touch everything around us. Even the underground tunnels were built for the film, so it was really easy for us to step into this world because we were really inside it. I think there was only one scene I was in involving a bridge, that was the only time we were in a full green screen environment. SR. Your character Katherine Valentine is the daughter of Thaddeus, player by the great Hugo Weaving. How much time did you guys prepare together before start filming? Did Hugo give you any advice? LG. Hugo is a lovely guy. We meet up before going to New Zealand which was very nice, because it allowed us to chat and discuss about the film and our characters way before shooting and going deep into our ideas and our characters backstories, which helped me a lot especially while taking about who my mother was in the story and stuff like that. SR. We assume you have to audition for the role. How hard and stressful was that process? LG. Omg, you have no idea. I did my first audition in London and then I kind of forgot about it. Then I got a second call to go back in, and at that time I was in LA, so I got the book and started reading it for the first time and I was totally into the character of Katherine, because I liked her backstory with this father-daughter relationship and how she is this kind London socialite, and as I grew up in London I kind of relate with the character a bit. So after the call back, there was another one and then I didn’t heard anything for like a month, which was the most stressful part of all, as at that time I was already back in LA. However, I remember the exact same spot where I was when I got the email saying I got the role, and I could not believe it! I was so happy and I told my family and my friends, because you know this film totally changed my life. So now every time I drive pass that spot, I remember the moment when I stopped at the side of the road and got one of the best news of my life. LG. I’ve another film coming up next year called ‘The Kid’ that I cannot really give much away, because my dad Vincent D’Onofrio directed it so he will kill me if I give too much away (laughs) but it’s a western and Chris Pratt, Dane DeHaan and Ethan Hawke are on it. SR. We must say, Your dad is probably the best character in Daredevil! What do you think about his role as Mr. Wilson Fisk? LG. I love it! I mean he is a great actor and for this role he was so lucky because seriously he fits the character perfectly, he looks the same as the one in the comics. I love walking with him around because is funny, as nobody bothers me as I’m next to the Kingpin (laughs). Seriously, you should see the look of people when he walks around, everyone looks at him like if he was the Kingpin for real (laughs). SR. You were born here in Australia. Just wondering if you keep an eye on the Australian film industry and what is your take on the “Aussie invasion” in Hollywood, with actors like Chris and Liam Hemsworth, Sam Worthington and young Angourie Rice pretty much taking over the world. LG. I love the invasion (laughs) and I also think the stuff coming out from Australia is beautiful, and I’d love to comeback and work in some films here. Australian films have always been great, but now finally they are getting a little bit more of recognition. As you said, there is huge talent here in acting and also in film-making, so there is no surprise many are going to the states. SR. 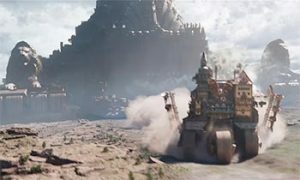 Going back to Mortal Engines and to start wrapping up. 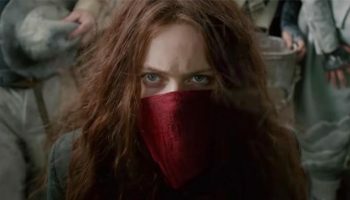 Can you share with us any funny story while on set and also your favourite Mortal Engines moment? LG. My favourite moment is hard to describe, because if I do it’s gonna give too much away, but I can tell you it was during one of my last days of shooting and it’s my last scene in the movie, because that was the moment where I kind of stopped and look around an realise what I was part of and it felt amazing! Funny story, was when we were filming at the museum and we were watching this old footage of “something” on a little kind of goblet screen thing, and I passed it to Robbie Sheehan who plays Tom, and it was super-glued to my hand and I could not get it off, so we had to stop for a while until the crew was able to figure out how to take off this little futuristic thing off my hand (laughs).